I’m trying to do a better job of using fresh produce instead of letting it wilt in the refrigerator. I had a package of fresh strawberries that flashed warning signals at me every time I opened the refrigerator. 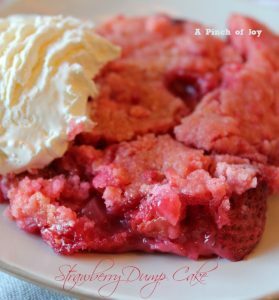 This morning I saw the package of strawberry cake mix in the pantry and Strawberry Dump Cake was born. A dump cake means that dry cake mix is “dumped” over fruit that has been “dumped” in a pan and then the whole shebang is covered with melted butter. Not quite a cobbler or a crisp but not a full fledged cake either, it is a big timesaver. Therefore, a legitimate dessert 🙂 If the cook is on a tight schedule, usually the eaters are too. And they are looking for something fruity that tastes good. Dump cake wins again. The strawberries and strawberry cake mix complement each other very nicely. I used frozen mixed berries with the strawberries since I was about half a cup short. Worked nicely. There is enough sweetness in the cake mix that the sugar becomes a vehicle for the spices and less a sweetener. You can substitute regular margarine, if you like, for the butter. You can wash, hull and slice 4 cups of fresh berries in about 10 minutes. I keep cinnamon sugar mixed and on hand so it is a matter of measuring and adding a bit of nutmeg. In less time than it takes to preheat the oven you can have this ready to go – say about 15 minutes. For those who were kind enough to ask – we are still having technical difficulties at A Pinch of Joy. Computers don’t like being moved apparently as we have progressed from one problem to another ! There is a now new computer setting on my desk that has needed all sorts of tweaking to do what I want. I have backups of everything that’s already published but not posts that were in progress so until Bytes can source the adapters needed to access the old hard drive we are in limbo. One of these days we’ll be back to normal. Like “before we moved and can’t find anything” normal. Like “before we started living in first one construction zone and then another 1000 miles away” normal. Well – that might be pushing it yet . . . . . but I am hoping. Spray or grease 9x13 baking pan. Spread sliced berries evenly over the pan. Mix sugar and spices together and sprinkle over the berries. Pour DRY cake mix evenly over the strawberries. Melt butter for 30 seconds in microwave and pour evenly over dry cake mix. Bake for 30 minutes or until top of cake is slightly browned and cooked through. Linking up to these awesome parties Full Plate Thursday / Artsy Fartsy / Idea Box / Friday Features / Grace at Home / Kitchen Fun/ Feathered Nest Friday /The Handmade Hangout /Foodie Friends / Creativity Unleashed / Craft Frenzy Friday / Friday Link Party /. Nice and easy. Thank you. I’m living the same way you are and it’s very frustrating buying things I know is packed in some box. I sympathize.